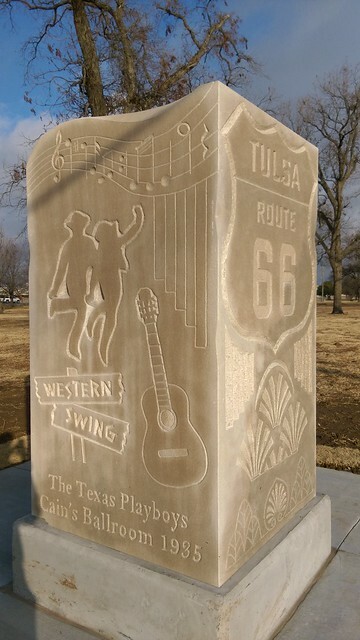 We have something new in downtown Tulsa. 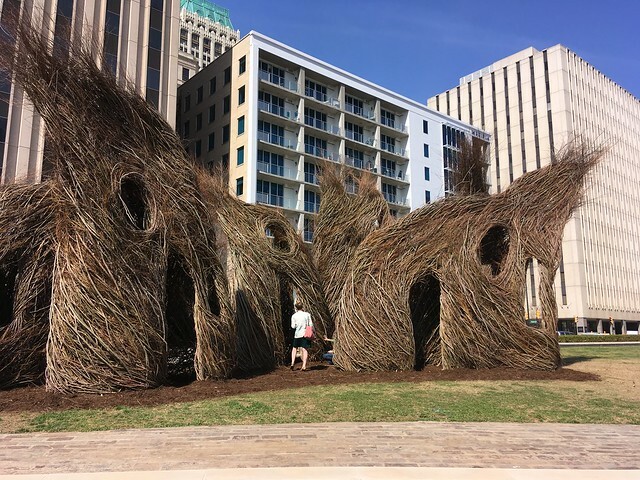 Stickwork artist Patrick Dougherty, with a lot of help, installed “Prairie Schooners” at Tulsa’s least used park, Chapman Centennial Green on the south edge of downtown. 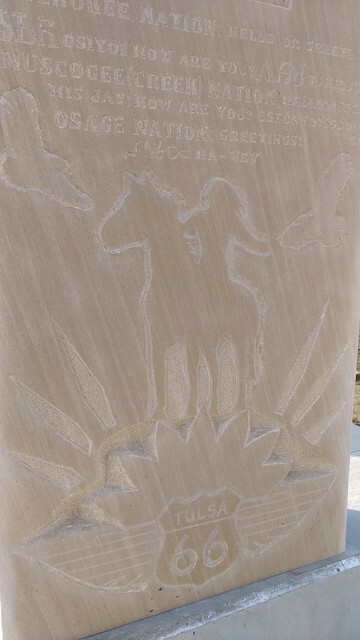 The project was sponsored by the Urban Core Art Project. 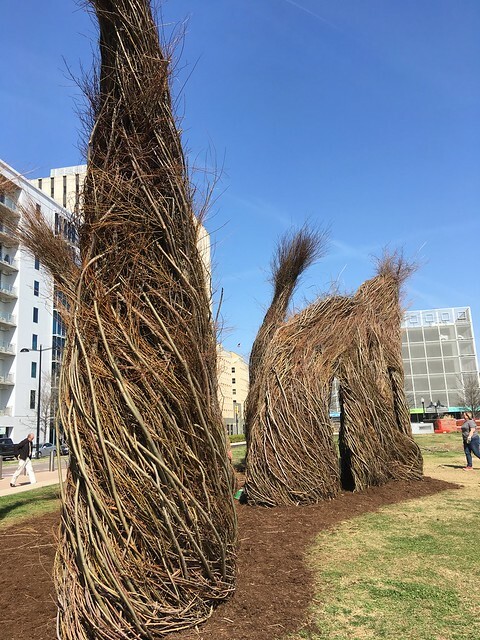 It is made up of branches and sticks from trail cleanup and tree trimming projects here in Tulsa. They are in there very good. The day I took these photos there was a gale blowing downtown and the structures were not going anywhere. The tops were waving about fairly well. 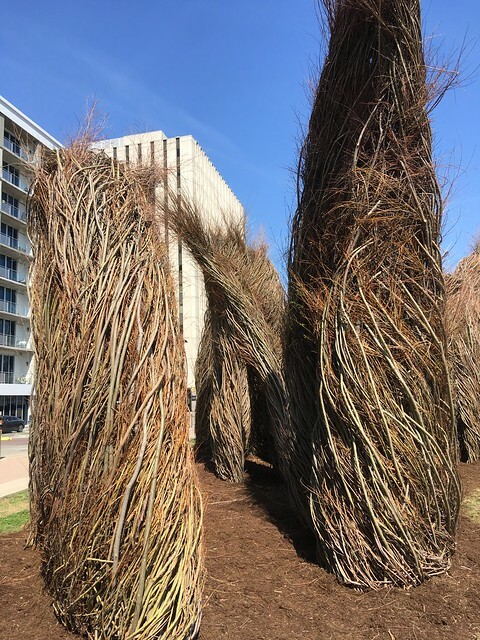 I don’t know how they rooted the structures in but they in good. 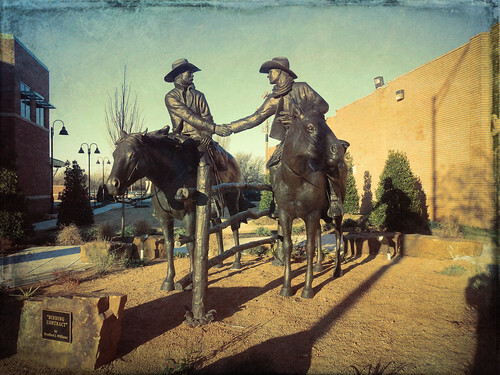 Prairie Schooners is what the covered wagons that the pioneers used to go west and steal land from the Native Americans. I can see the resemblance to that. It also looks like sailboats out ocean. 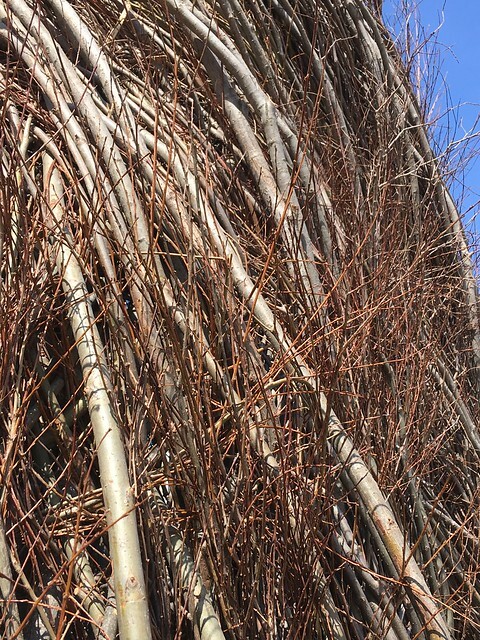 The structures bend and wave in the strong wind and seem almost alive, they way they move. They look ghostly. 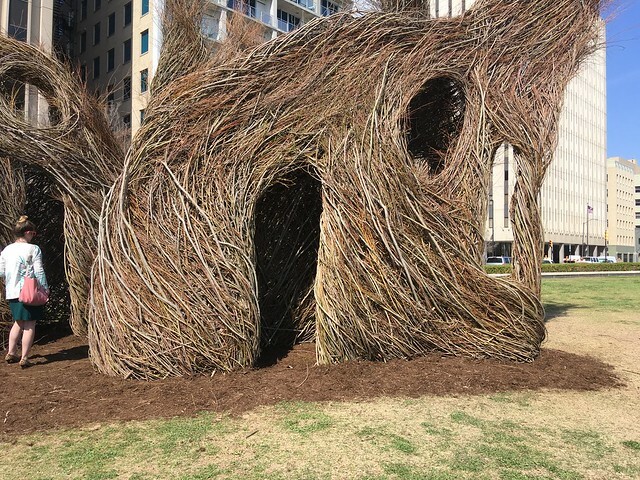 An example of the complex and very strong weaving of the natural materials used to make the structures. They are very complex and make little rooms and there are no “Do not touch” signs anywhere. The place invites touching. It’s a very happy place. 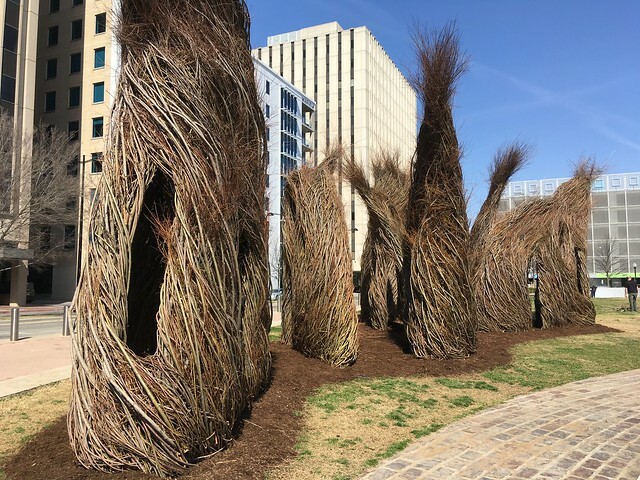 It is due to be installed for a year, until March 2019, so you got some time to check it out yourself. 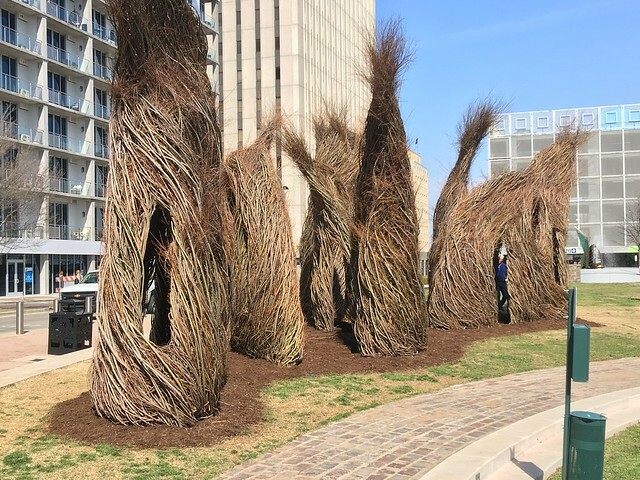 This entry was posted in Our World Tuesday and tagged Art, Our World Tuesday, Patrick Dougherty, Prairie Schooners, Public Art, Stick Art, Urban Core Art Project on April 8, 2018 by Alan Bates. Wednesday evening was springlike. In the 70’s and a very light feel on the skin. 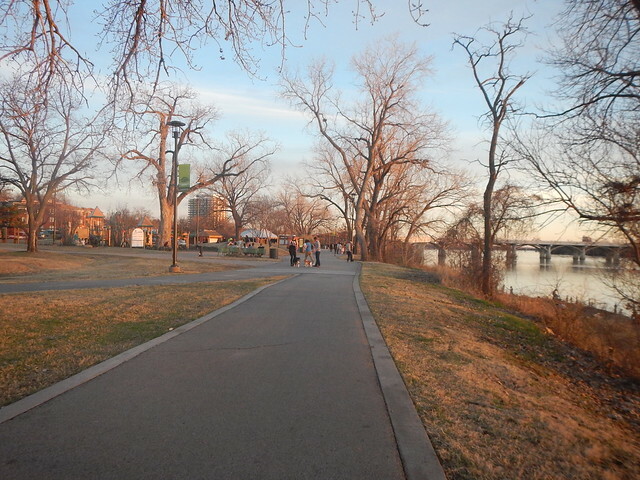 I headed to the Arkansas River for my weekly evening run and it was crowded so I had to park in the satellite lot. Walking south I noticed a lot of people hanging out on the trail and I heard music and a rather good natured, nice party vibe going on. I got closer and I noticed some rocks in the water which were new. I’ve been running this stretch of river for 25 years so I know when I see something new. You can just barely see them in the photo above to the right. 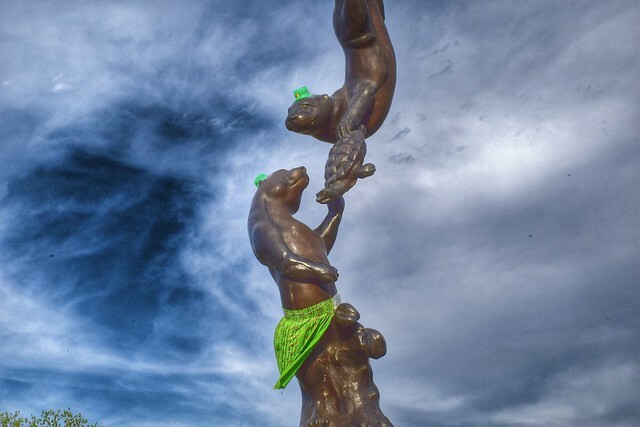 So I went to check them out. 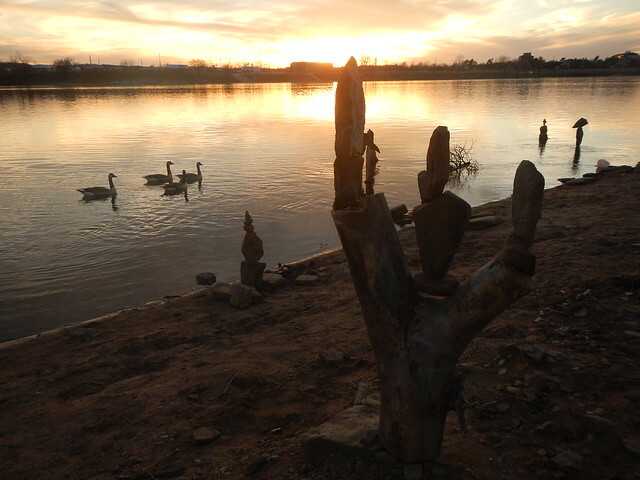 Somebody had put in some balanced rock art in the river and the shore. I had never seen anything like this and I was enthralled.They were both in the river and the shore. I thought it was cool. There were also people nearby sitting around campfires and just having a good time. I had never seen that either. I’ve seen homeless people with campfires but never just regular people. I’m sure they were violating some rule or another but they were not bothering anybody. 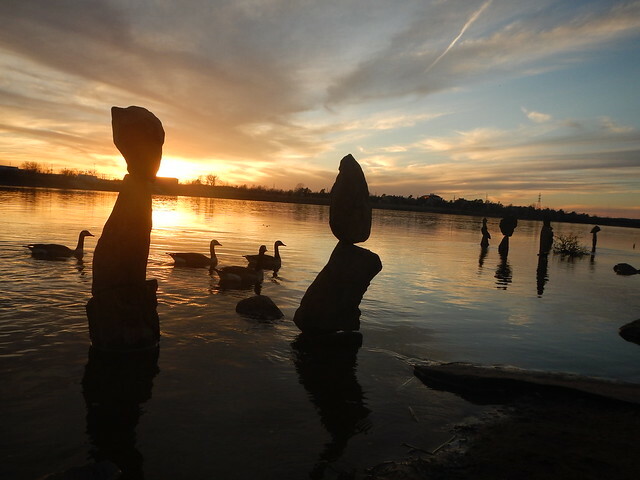 So reading up on balanced rocks, I guess they are kind of controversial because some places they do way too many of them. Plus they are not welcome in National Parks where you are not supposed to gather anything natural like rocks, sticks, wood or anything else. 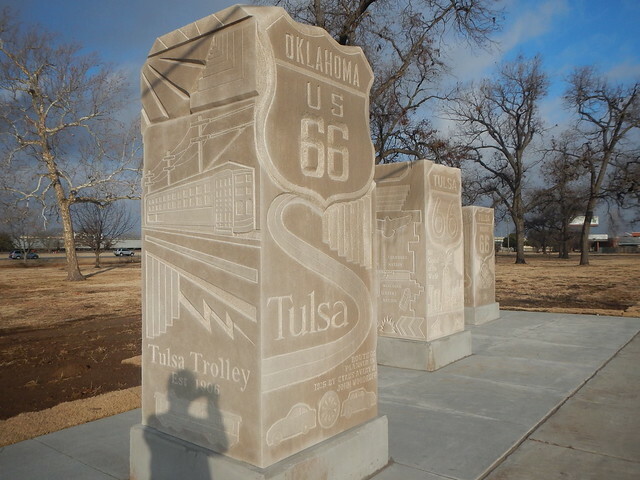 But on the banks of the Arkansas River last week they were a welcome addition to the scene. I’m linking (for the first time I think) with Scenic Weekends. 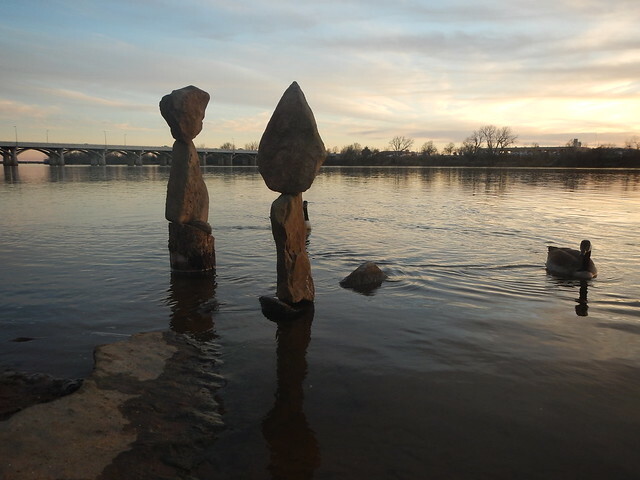 This entry was posted in Scenic Weekends and tagged Arkansas River, Art, Balanced Rock Art, Found Objects, Oklahoma, Public Art, Scenic Weekends, Stacked Rocks, Tulsa on February 24, 2017 by Alan Bates. 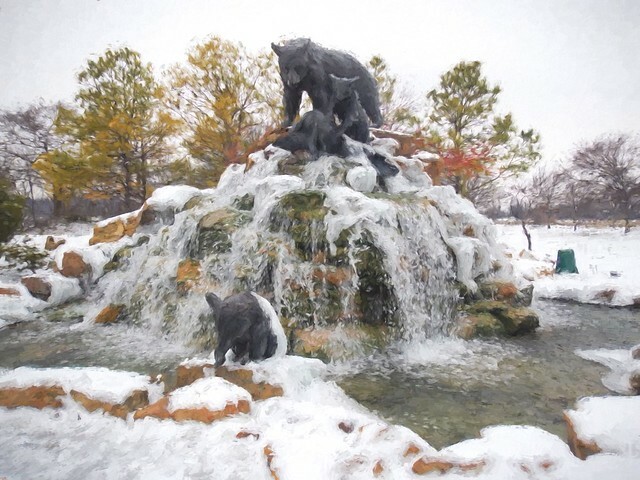 Last week before the five or six days of rain at one of my favorite fountains and sculptures on Tulsa’s River Parks. 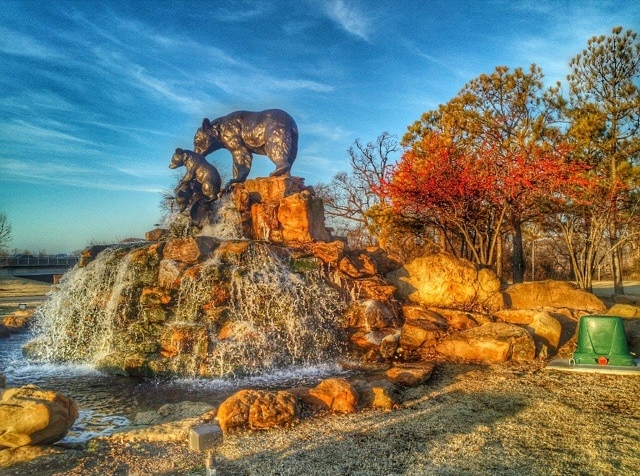 This entry was posted in Skywatch and tagged Art, Fountain, Oklahoma, Oklahoma Skies, Public Art, Sculpture, Skywatch Friday, Tulsa on December 3, 2015 by Alan Bates. 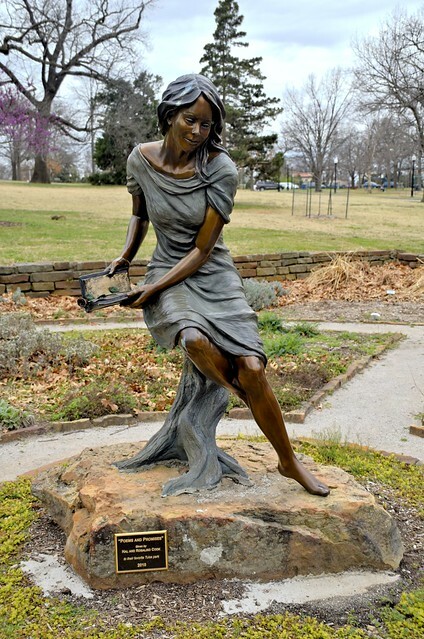 Appeal to the Great Spirit is a sculpture in Tulsa’s popular Woodward Park. 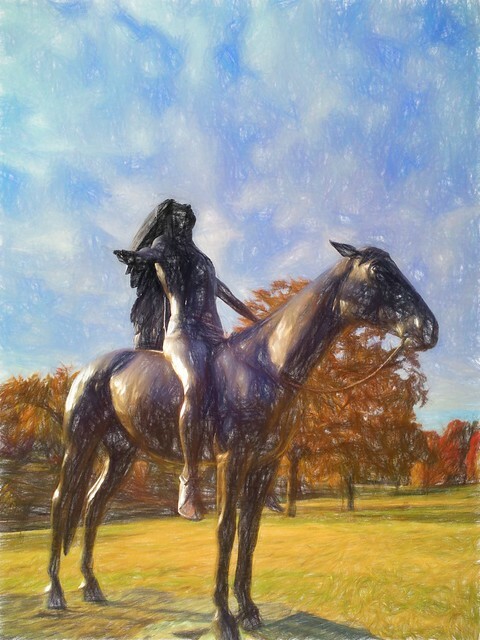 I redid my digital photo using Topaz Labs Impression program using one of the “Colored Pencil” effects. 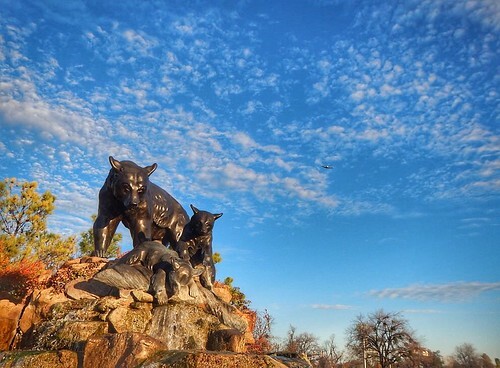 This entry was posted in Digital Art Meme and tagged "Topaz Impressions", Art, Digital Art, Digital Art Meme, Public Art, Sculpture, Woodward Park on January 14, 2015 by Alan Bates.